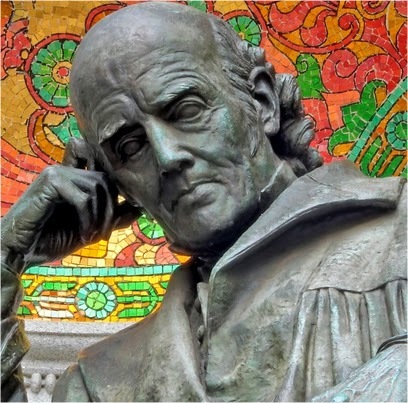 Christian Friedrich Samuel Hahnemann was born on 10th April 1755 in Meissen, Saxony, near Dresden. His Father was Christian Gottfried Hahnemann, and mother Johanna Christiana.He lived at the corner House. He Joined prince school in 1770. While leaving school in 1775 he wrote a "essay on wonderful construction of human hand". In 1775 he left for Leipzig with 20 Thaler in his hand. He went to Vienna in 1777and worked with Dr.Vonquarin in brothers of mercy hospital. In 1779 he was awarded MD for the work "a consideration on aetiology and therapeutics of spasmodic affections". During 1779-81 he practiced in Hettstedt and during 1781-83 he practiced at Dessau. On 1782 November 17th he married Johanna Leiopaldine Henriette .In 1783 his Daughter Henriette was born. During 1784-89 he was at Dresden .In 1786 he wrote on poisoning by arsenic (Essay). During 1789-92 he lived in Leipzic. In 1790 He translated Cullen's treatise of Materia medica (2 volumes, first one 468 and second 672 pages, published 1789 and 1790). He took 4 drachms of cinchona and there was the birth of homoeopathy. During 1805-10 he lived at Torgau. In 1805 the famous publications were Medicine of experience ,Aesculapius in the balance and the Fragmenta de viribus medicamentorum positivis sive in sano corpore humano observatis which was written in Latin contained 27 medicine. In 1810 came the First edition of organon.A Berlin professor A.F.Hecker attacked organon by publishing Anti organon in 1810. During 1811-21 he at Lepzic. In 1811 First volume of materia medica pura (Latin name Reine arzneimittellehre) contains 12 drugs was published. In 1816 the second volume with 8 medicines In 1817 came the third volume with 8 medicines. In 1818 the fourth volume with 12 medicines was published. In 1819 the fifth volume with 11 medicines and in 1821 the Sixth volume with 10 medicines were published. There are 6 volumes & 61 medicines plus 3 magnets in the first edition of materia medica pura. Among these 22 medicines are taken from fragmenta and was Translated by Hempel. In 1819-second edition of oragnon was published. In 1816 "treatment of burns" was published. Then in 1817 he published "Examination of sources of common materia medica" . From 1821-35 he was at Koethen and in 1822 thee second augmented edition of materia medica pura was published. It appeared volume by volume like the first edition in the years 1822,1824,1825(2volumes)1826 &1827.Each contained same list of medicines like the previous one except that of Ambra grisea ,carbo animalis and carbo vegetabilis which was introduced in 6th volume.Thus it has 64 drugs plus 3 magnets and was translated by Dudgeon. In 1824, the Third edition of Organon and during 1828-30 4 volumes of chronic diseases (die chronischen krankheiten) was published. It contained 22drugs. In 1829 the Fourth edition of Organon was published. and in 1830 Joahana leopardine Henriette died. Fifth edition of Organon was published in 1833. In 1834 Second marriage was with Marie Melanie de harvilly . In 1835 he shifted to Paris . From 1835-39 Second edition of chronic disease was published in 5 parts & contained 47 drugs. In 1842 manuscript of sixth edition of Organon was complete and on 1843 July 2nd Hahnemann died in house at Paris,no.1,Rue De Milan. For 9 days His wife Melanie kept the body and on 11th July body was buried in cemetery at Montmartre Hill. The Body was buried in a grave where already 2 bodies were buried (Body of Gohier a French leader and Her foster father LeThiere). His body was exhumed and re-buried at Pere Lachaise on 24th may 1898 . Thirty five persons were present in the reburial. His grand son Dr Suss Hahnemann also attended the reburial. He was the only eye witness to the both burials. The inscription Hahnemann chose to be inscribed on the tomb was NON INUTILIS VIXI (not lived in vain). He proved 99drugs.